Big thank you to Sacred Heart Catholic School’s Dig Deep appeal. CAFOD Southwark Office would like to say a huge thank you to Sacred Heart Catholic School’s sixth form students Tristan, Emiljan and James for their wonderful efforts in raising money and awareness for CAFOD’s Dig Deep appeal. This year’s campaign focuses on the life of Mohammed, a 14 year old boy living in Sierra Leone whose family, like so many others continues to be affected by the aftermath of the country’s brutal civil war. Through a local organisation, Caritas Kenema, CAFOD has worked with Mohammed’s family to transform diamond mines in to fertile farmland. With the food they grow from the land, Mohammed’s family can survive Sierra Leone’s ‘hungry season’ which lasts roughly six months of the year. The family can sell the extra food they do not need and save money. Mohammed’s mum hopes to use these savings to send him to school next term. To raise awareness of CAFOD’s Lent Fast Day appeal and to share Mohammed’s story, Tristan, Emiljan and James led assemblies for all year groups where they talked about important topics like poverty, food security and education. One particularly imaginative idea was asking students to note down Lenten promises on a card which were then attached to a beautiful wooden cross that the Design technology class made, the cross is currently placed in the school atrium for all to see. They also decided to raise funds for CAFOD by arranging a charity football tournament for boys in both the lower and upper school because of Mohammed’s love of football. 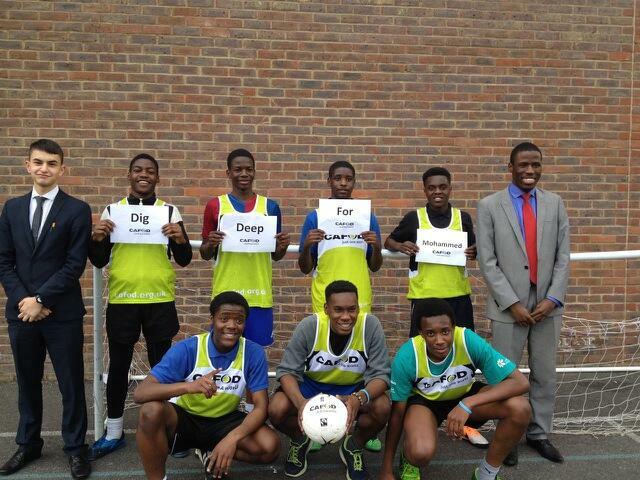 Emiljan says, “The reason why we chose to put on a football tournament is because everyone likes football and raising money should be fun!” Due to their tremendous efforts and creativity, the boys raised over £200 pounds for CAFOD’s Dig Deep appeal. 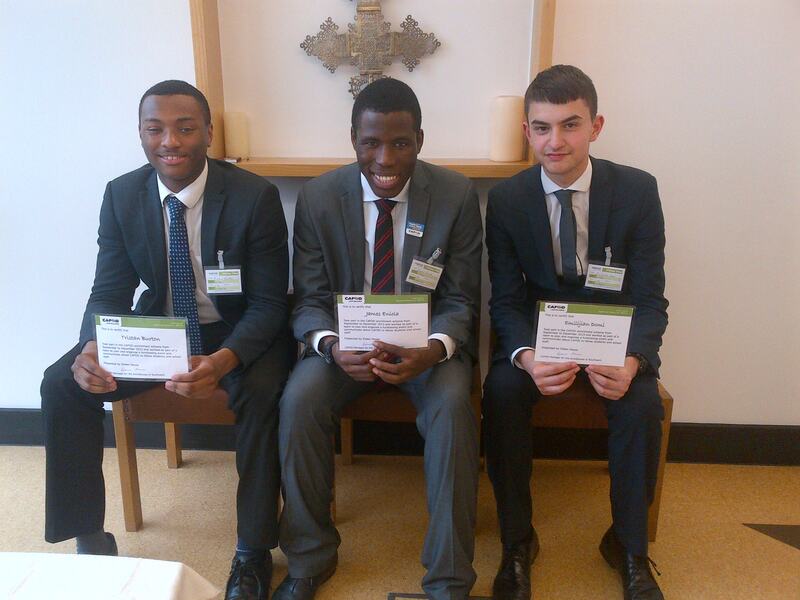 Tristan, Emiljan and James were presented with certificates from CAFOD, once again, thank you for all your hard work! This entry was posted in Upcoming CAFOD event and tagged CAFOD, CAFOD Southwark, fundraising, Lent Fast Day, schools, young people, youth by cafodsouthwark. Bookmark the permalink.